Popular opinion has long assumed that learning a foreign language requires not only traditional classroom instruction but also immersion among native speakers of the language. This opinion is so strongly held that students who study through immersion are believed to become more proficient than those who do not. 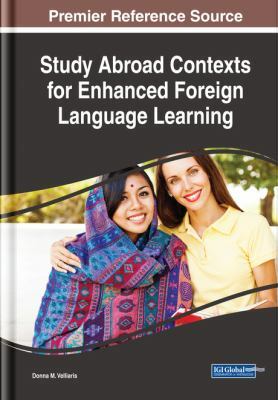 Study Abroad Contexts for Enhanced Foreign Language Learning is a critical scholarly publication that explores the importance and efficacy of international travel in the learning of a second or additional language. Including various topics such as auditory-orthographic training, grammatical ability, and learner autonomy, this book is geared toward academicians, students, and professionals seeking current and relevant research on language acquisition through immersion and its value.